The CoffeeShop Blog: CoffeeShop "Photographer Storyboard #41"! Today I have a really nice photographer blogboard to share with you. 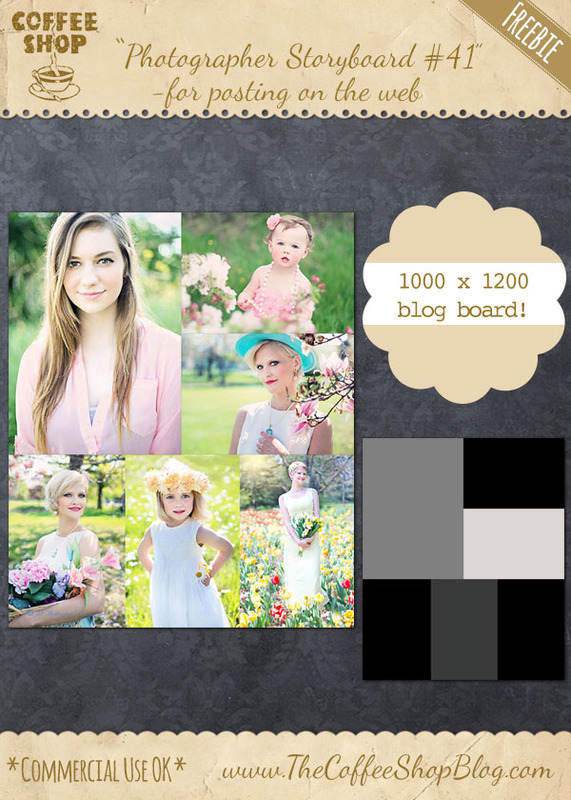 This storyboard is 1000 x 1200 pixels and perfect for displaying your photos on your website or blog. I also have an Photoshop/PSE action that automatically builds and loads this blogboard if you prefer to automate the storyboard. Once you run the action you can add your images using the clipping masks (tutorial and free action). I want to thank Jill Wellington (Etsy Shop, Facebook, Blog, YouTube Videos, Pixabay) for allowing me to use her images in my example. Download the CoffeeShop "Photographer BlogBoard #41".. You can also download it here.